(FULL COLOR E-BOOK EDITION, 264 pages, instructional). Simple techniques with stunning results! This e-book is chock full of complete decorating instructions, templates, color coded illustrations, and large cake photos. Packed with remarkable, signature one and two layer cake concepts from the Beverley Way Collection online gallery, the cakes presented have been carefully designed and selected to present unique original designs with very little overlap to concepts found in other retail cake decorating instruction books. The designs include those incorporating a wealth of handcrafted icing roses, hand piped icing lace, ornate icing extensions, run-out decoration, hand painted fondant and more. This Beverley Way Collection e-book presents all 264 pages of the original illustration-packed premium paperback in full. The content of this e-book remains identical to that provided in the premium full color paperback. The templates presented are available in actual size via the Beverley Way Collection website or the paperback editions of this book. 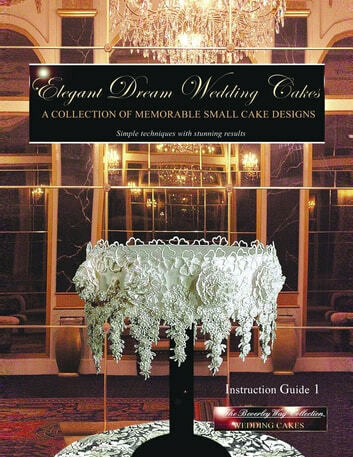 The primary focus of this instructional book is on how to recreate the exterior decorative icing appearance of each cake presented. As such, cake recipes and baking have intentionally not been addressed in this book. However, instructions to create all icing parts and pieces as well as the required icing recipes are included in this e-book. Best of all and to the decorator's delight, the decorative icing work employs simple common decorating technique, two or three common icing tips, and easy to obtain additional materials. Care has been taken to describe any specific decorating techniques employed. The very basics of decorating such as filling icing bags, attaching icing tubes, doweling cakes etc. are not intentionally outlined in this book due to the wealth of basic skill retail handbooks currently available addressing these details at length.